No one likes ineffective meetings. They are just a waste of time and not at all pleasant. These meetings create a negative atmosphere and cost a lot of money. And to think that conducting an effective meeting is not hard at all! 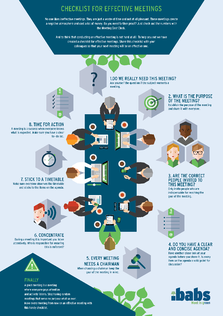 To help you out we have created a checklist for effective meetings.